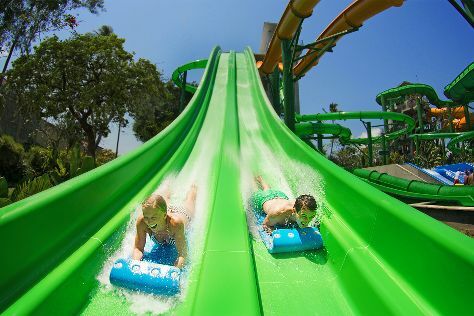 Attractions like Waterbom Bali and Pantai Sanur make great kid-friendly stops. Venture out of the city with trips to Green Camp Bali (in Abiansemal), Kuta Beach - Bali (in Kuta) and Pura Puseh (in Sukawati). Spend the 7th (Fri) among aquatic life with a scuba or snorkeling tour. Pamper yourself for a day on the 8th (Sat) at some of the top local wellness centers. The adventure continues: identify plant and animal life at Sacred Monkey Forest Sanctuary, relax and float downstream with a rafting and tubing tour, relax in the rural setting at Tegalalang Rice Terrace, and enjoy the sand and surf at Seminyak Beach. To see reviews, photos, where to stay, and other tourist information, refer to the Denpasar vacation planner . Reykjavik, Iceland to Denpasar is an approximately 23.5-hour combination of bus, flight, and taxi. The time zone difference moving from Greenwich Mean Time (GMT) to Central Indonesia Time (WITA) is 8 hours. Plan for warmer temperatures traveling from Reykjavik in June, with highs in Denpasar at 35°C and lows at 29°C. Finish your sightseeing early on the 18th (Tue) to allow enough time to travel to Nusa Lembongan. Attractions like Scuba & Snorkeling and Jungut Batu Beach make great kid-friendly stops. There's still lots to do: look for all kinds of wild species at Devil's Tears, snap pictures at Yellow Bridge, experience rural life at Seaweed Farming, Nusa Lembongan, and delve into the lush surroundings at Mangrove Forest Nusa Lembongan. To see maps and other tourist information, use the Nusa Lembongan trip planning website . Getting from Denpasar to Nusa Lembongan by combination of taxi and ferry takes about an hour. Expect a daytime high around 35°C in June, and nighttime lows around 29°C. Cap off your sightseeing on the 22nd (Sat) early enough to travel to Amed. On the 23rd (Sun), kick back and relax at Jemeluk Beach and then get a new perspective on things with Boat Tours & Water Sports. Here are some ideas for day two: steep yourself in history at USS Liberty Shipwreck, then admire the natural beauty at Tirta Gangga, then experience rural life at Sorga Bali Chocolate, and finally enjoy the sand and surf at White Sand Beach. To find other places to visit, where to stay, reviews, and other tourist information, refer to the Amed visit planning site . Getting from Nusa Lembongan to Amed by combination of ferry and taxi takes about 2 hours. Other options: do a combination of ferry and bus. Traveling from Nusa Lembongan in June, you can expect nighttime temperatures to be a bit cooler in Amed, with lows of 26°C. Wrap up your sightseeing on the 24th (Mon) to allow time to travel to Tegalalang. Kids will enjoy Elephant Safari Park and Scuba & Snorkeling. Venture out of the city with trips to Tabanan (Lake Beratan & Ulun Danu Bratan Temple) and Kintamani (Kintamani Plateau, Mt Batur, & more). The adventure continues: contemplate in the serene atmosphere at Tirta Empul Temple, take a pleasant ride with Ubud Horse Stables, relax in the rural setting at Bali Pulina Agro Tourism, and get the lay of the land with Pande's Farm. To see more things to do, where to stay, ratings, and tourist information, go to the Tegalalang vacation planner. Traveling by car from Amed to Tegalalang takes 2.5 hours. Expect a daytime high around 35°C in June, and nighttime lows around 29°C. Cap off your sightseeing on the 29th (Sat) early enough to travel back home.